I recently bought a new Bible. The old Bible I had was good but it was geared towards High School and college students, neither of which I am anymore. I will definitely keep the old Bible but I felt I needed something that was more "me." I was also hunting something that would help me be able to have a quiet-time or devotional each morning. 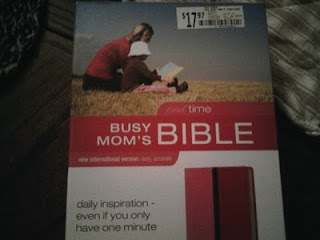 While browsing around the store the other day, I found the Busy Mom's Bible from Zondervan. I thought it was decently priced and it's very cute (pink!) to boot. It's an NIV which I think is pretty easy to understand. Another good feature is that it has "one minute thought starter" devotionals that also give you the option of delving deeper into whatever part of the Bible you're studying that day if you have more time. I would like to start doing a study (maybe on Sundays?) with these thought starters. You're welcome to join in, if you have the Bible - and even if you don't have it, I could post the material in a blog post once a week for you to see. We could discuss whatever story or passage it is that day or have a blog-hop/link-up if you'd like to write your own posts about it too. Would anybody be interested in joining in on this? Leave a comment and let me know. I think that's a good idea; I got invited to a Mom's breakfast and bible study starting next month and I think I'm going to go-who knows what it may lead to? Suzanne, I think I'm going to be posting it on Sundays - I don't have a Bible Study that I go to regularly either! Chrissi, that sounds good and you're right, you never know!